For the past 3 to 4 years, my wife and I have been tracking our family’s net worth here on The Money Sprout. At first, we tracked our net worth once every 3 months or so. Then about 2 years ago, we decided to get serious about reaching financial independence (FI) and started tracking it every month. The majority of months we report … we are usually happy to report an increase in our net worth. These increases come from a combination of building our assets while lowering our liabilities … pretty basic stuff really. October was not one of those months. After huge run ups in net worth for the past 6 months or so … we finally got hammered by almost 4%. Last month … our net worth declined by a good chunk mostly caused by stock market declines. So how did we do this October? 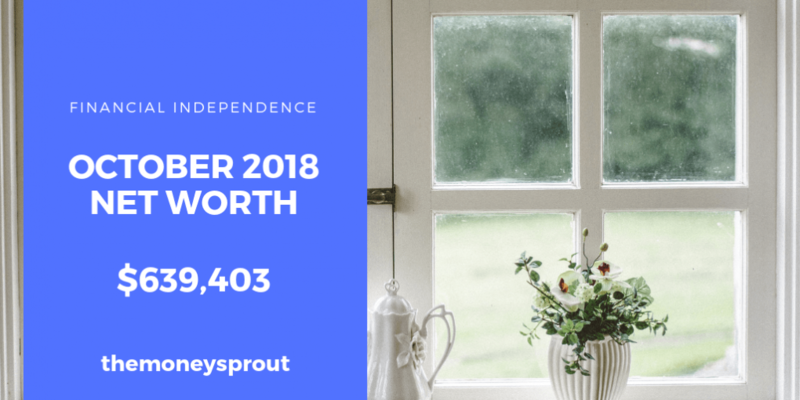 As of October 31st, 2018 – our net worth is $639,403. Overall, that is a large decrease of over $26,000+ in net worth in one month. After setting a record last month for our highest net worth totals ever (September 2018), we had a correction … which is actually a healthy thing in the long term. Despite having our assets drop because of the stock market decline, we still managed to pay down some debt … which was a good thing. 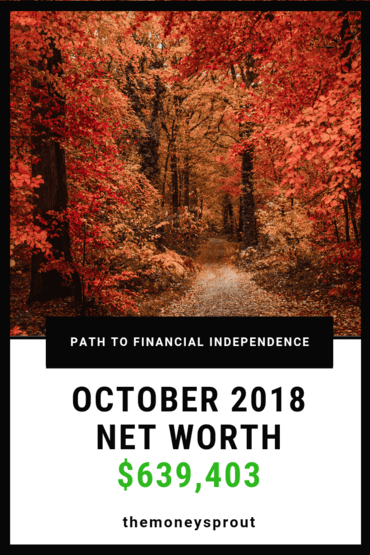 Our net worth in October 2018 decreased by (3.93)% compared to September. These equity investments are currently (and likely will always be) our highest valued asset. During October our investments took a hit as the stock market had a good sell off. Overall … our investment assets dropped by over ($26,000) in October compared to September. After many consecutive months (and years) of double digit monthly gains, the market finally corrected a bit. Our investments reflect this decline. Overall our cash declined by over $3,000. We were in the process of paying down some of our credit card debt from spending. Not too much to worry about really. Note – When it comes to cash … I find it a very inefficient way to build wealth. That is why we put it to good use either paying down debt or investing it whenever we can. The estimated value of our home increased this past month compared to September. That is a nice $2,000+ increase to help offset a little bit of those stock market declines. Again … these are just estimates of our home value and nothing I will get that excited or concerned about. Our biggest asset class (stocks), saw their largest decline in over a year by falling ($26,000+) last month. Our cash balance also dropped by another ($3,000+) making our net worth fall even further. The one bright spot of the month was a nice little jump in the estimated value of our home. Overall our total assets dropped by (3.13%) since last reporting … which was a large decrease. This was one of the biggest declines we have seen in our assets since we started reporting net worth close to 4 years ago. The last category is our car loan(s). We plan to have one of our vehicles paid off completely by next summer. The other vehicle is a 0% interest rate loan … so we are in no rush to pay extra on that one. Here is a high level breakdown of each liability category. We have a 30 year mortgage on our home with an interest rate of 4.375%. If we were to continue paying the minimum monthly amount … our home would be paid off in about 20 years or so. But that isn’t necessarily our plan. Each month we make a mortgage payment, our principal drops by a little bit more each month. This past month we got a boost by adding another $21 to our payment. One of these loans is for our “family vehicle” (a van). This loan has a very low 1.56% interest rate and we are about 10 months from having it completely paid off. This liability is referred to as “Car Loan #1”. The second car loan (referred to as “Car Loan #2”) currently has about 4 years, 3 months until it is paid off. The big difference here is that this second car loan has a 0% interest rate … so we are not in a huge rush to get it paid down. Although I wouldn’t mind getting this debt off our books for piece of mind sometime in the future. During October … we saw a small drop in debt on car loan #2. Based on the timing of making our payments, we didn’t lower our debt on car loan #1 … but fully expect it will be paid off by next August (2019) at the latest. Overall, we were able to increase our net worth by almost $250 … just by making this monthly payment on car loan #2. Basically all of the spending we do is done through travel rewards credit cards. The only exceptions are paying our mortgage, car payments, and our electrical bill. One important thing to keep in mind is that we never let our credit card payments slip past their due date. Paying interest or late fee’s is a complete waste of assets. During October, we saw a very slight decrease in our month to month credit card balances. Collectively our total liabilities decreased by over $750+. The one thing I like so much about paying down our liabilities … is the results are permanent. Once part of the principal is paid off … it is gone for good. The market cannot take that back away from you. Not only does it keep us accountable in how we save, earn, and invest … it is great motivation when you see growth like we have over the past 3 to 4 years. For example, our first ever net worth report was posted back in March 2015 … which was 3+ years ago. We reported a net worth of $434,984 back then. Now we are over $600,000 in new worth … which is a sizable increase in less than 4 years. We also realize the huge gains in the stock market have helped us grow our net worth. And despite losing over $26,000+ of our net worth last month, we feel the gains leading up to that point are more than we could have asked for. Do you track your net worth? How did your October net worth totals turn out? What steps are you taking to widen the gap between your assets and liabilities?